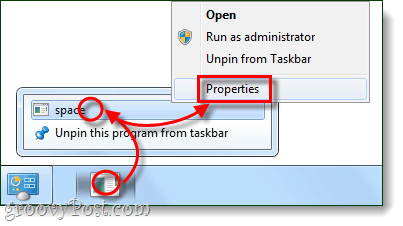 The Windows 7 taskbar has a groovy pinned icon taskbar system that works quite well. But, despite its flexibility it doesn’t allow you to space out your icons in whatever way you like. Sure, you can easily change what order icons are listed in (click and drag), but what if you want to separate groups of icons and leave a blank space in-between? With this groovy How-To I’ll show you how to do just that. 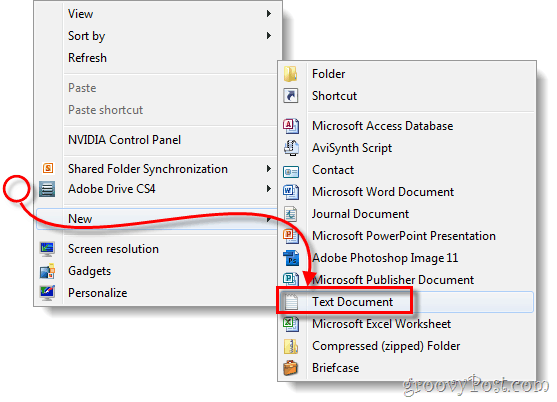 Right-Click any blank area on your desktop and Select New > Text Document. 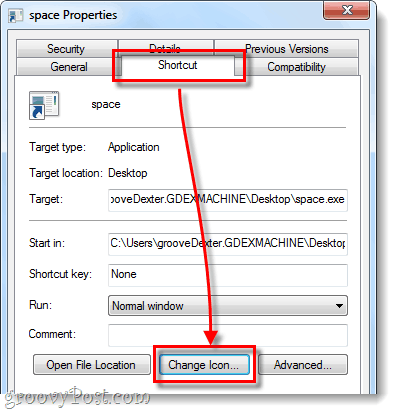 *To change file types more easily you need to set Windows to show file extensions. 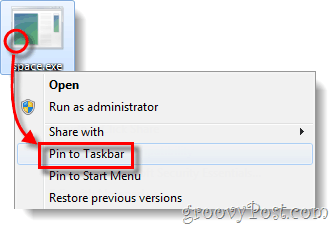 Right-Click your new .exe file and Select Pin to Taskbar. 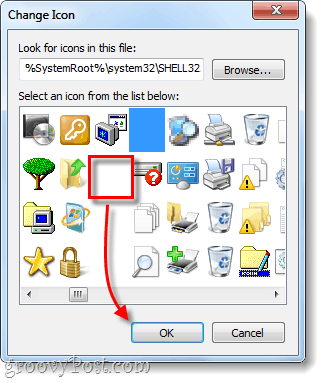 *Depending on your system settings you may have to Right-Click an extra item to access properties, as shown below. In the Change Icon window, Scroll to the Right until you see a blank space. This is a transparent icon that will show up blank, Select it and Click OK.
Click OK again to save changes and exit the properties window. You should now have a blank icon on your Taskbar and you can use your mouse to drag it around to wherever you like. At this point you can create as many blank spaces as you need to separate all of your Taskbar items; you’ll just need to make a new .exe file for each one. While I’m not entirely sure how useful this is, it certainly is a groovy geek trick! I love your trick, but it’s a dirty hack! Especially the “empty” executable and the transparent icon! I am not a Windows 7 user, but thank you for the trick! If this really disturbs you, then (if you know some C programming) make a program that does nothing and put it instead of the empty file. It would take you 2 minutes to do so. Thanks so much for this extremely neat hack! I have one question, though: Is there any way to change the invisible icon’s width? That way, you could create simple custom icons (color bar maybe), and then use those spacers to open explorer windows related to the programs they are dividing. Web browsers spacer could open XXAMP/http docs folder, 3d apps spacer could open root 3d projects directory, etc.